Superfast Swindon | How does it work? The superfast broadband for Swindon's residents and businesses will be delivered through a fixed wireless network provided by UKB Networks. UKB Networks will build 23 new 4G LTE base stations including an upgrade to nine existing ones that are already in use in throughout Swindon. To provide the high speeds base stations will be connected to high capacity microwave links hub sites in the town, where the data traffic will be routed via high capacity dedicated fibre lines to UKB Networks data centres. Each home and business will connect to the network with small, approximately 30 cm wide, aerial (outdoor unit or ODU) mounted on the outside of the building. Each aerial will face the nearest base station to receive superfast broadband and access to the internet. Town centre base stations are usually mounted on roof tops. Outside the town centre we will not be able to use roof top locations as there aren't any high enough. Therefore we will use a combination of towers and monopoles. 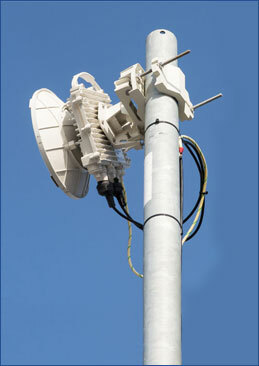 Microwave dishes are used to communicate between the cell sites. How will I receive broadband in my house? 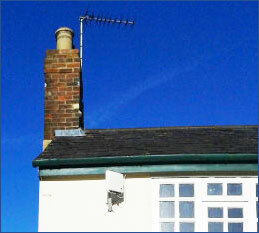 The superfast broadband will be received through an outdoor antenna unit (ODU) which will be connected to a wifi router within customer's home or office. A hole will need to be drilled through the wall for a cable to link the ODU to the wifi router. This cable will also supply the power to the unit outside. Installation will be managed through customer's chosen internet service provider (ISP). ODU mounted on a house. 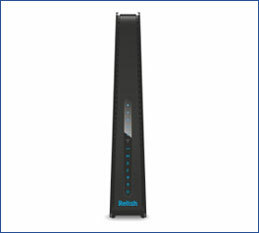 Example of a wireless router. Is this the first time this technology has been deployed in this way? No, there exist many 4G LTE networks both in the UK and internationally, including those already operated by UK Broadband in Swindon, Reading and London. How can we be sure it will achieve the required speeds? At the beginning of 2015 BDUK ran technical tests of the proposed network in Chiseldon. Those demonstrated that the network reaches the headline speeds and meets Swindon's requirement to provide 90% of those speeds during busy hours. The contract is based on the outcome which means that UKB Networks will invest its own money before accessing the BDUK grant. Swindon Borough Council also agreed milestones that UKB Networks needs to meet before they get the funding. Do I need to have any safety concerns? Although Swindon network was specifically designed to provide a fast data, it uses the same technology as any other 4G mobile network. Safety of mobile networks is looked after by the International Commission on Non-Ionizing Radiation Protection (ICNIRP) whose standards are adopted worldwide including the UK and UKB Networks. On top of that the UK Government takes advice from the Independent Advisory Group on Non-Ionising Radiation that has concluded there is no risk to adults or children from networks operated under suggested guidelines that UKB Networks follows. 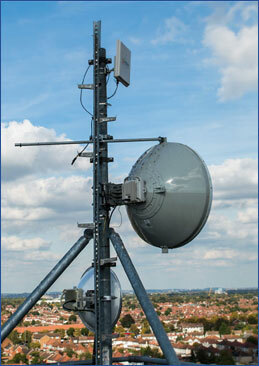 Will planning permission be needed for the wireless network equipment? 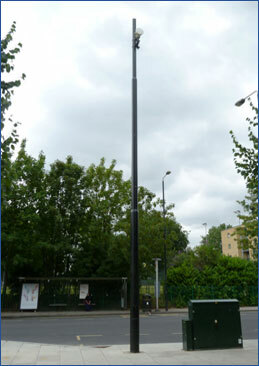 New masts and street monopoles will require planning permission and go through the Council's usual planning processes. Existing infrastructure, such as decommissioned mobile phone sites, will be used where appropriate. Installation of outdoor units on privately owned buildings doesn't usually require a planning permission. There are however exceptional circumstances such as installation of the equipment on a listed building that would need to get the appropriate permission. Further guidance is available on both the Planning Portal and planning section of the Swindon Borough Council website. Residents in rented accommodation will need to get landlord's consent prior to requesting installation of an outdoor unit.